Initially I used to think a colorful site can only be done by an incredible expert and it will cost so much, I mean a lot of money. Yes, it Does Costs, but depends on the kind of website or platform you want to create.. So as a beginner then, I never entertained any thought of getting or hosting a website of my own let alone having a superb one like this. Domain name is the name you want for your site for example; www.Ayojide.com where Ayojide is the domain name. Your hosting account is like your bank account, but this time not to bank but a website hosting company that will ensure your site is permanently on line. According to wikipedia; a website (alternatively, web site or Web site) is a collection of Web pages, images, videos or other digital assets that is hosted on one or more web servers, usually accessible via the Internet. 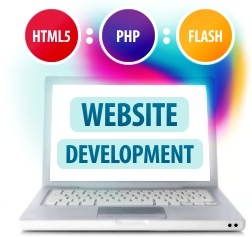 A Web page is a document, typically written in HTML that is almost always accessible via HTTP, a protocol that transfers information from the Web server to display in the user's Web browser. The pages of websites can usually be accessed from a common root URL called the homepage, and usually reside on the same physical server. The URL s of the pages organize them into a hierarchy, although the hyper links between them control how the reader perceives the overall structure and how the traffic flows between the different parts of the sites. All the text above might seem strange and confusing to you but the truth is that you don't need to know most of these terminologies to have or design your own website. All you need is a domain name and hosting account and with these the whole world will be watching you online . You could also have your personal but commercial web mail devoid of spam and acceptable.